Another year. Another pricing decline. It’s therefore imperative to ask how the market has changed thus far. While demand continuously increases, pricing in the market has been a bane for operators, continuously declining across key segments during the past 4-5 years. The chart below depicts % of decline from 2018 to 2019, with Enterprise Data and Gov/Mil segments most affected, primarily due to renegotiation of contracts and impact of HTS capacity. 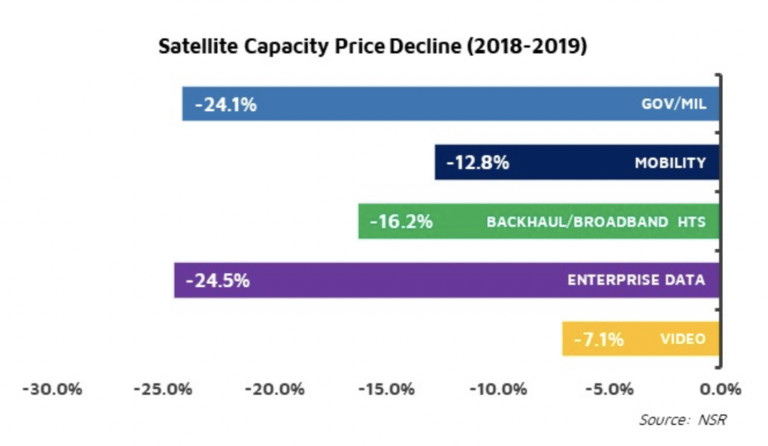 While backhaul and broadband HTS segments posted a consistent double-digit decline for 3 years in a row, as noted in NSR’s Satellite Capacity Pricing Index, 5th Edition, video posted a 5-8% decline in the same period, denoted by demand saturation and improving compression technology. Has the Market Passed its Judgement Then? Decoding the dynamics, the interplay between improving manufacturing technology and the race to grab market share has inadvertently pushed the satellite market to a point of no return. CAPEX per Mbps efficiencies are predicted to increase 66%, as the Break-Even pricing (lowest price offered without losing money for an operator) registers a low of $12/Mbps/month by 2021 for GEO satellites. In the same period, HTS supply is predicted to increase 223%, widening the supply-demand gap to an all-time high. Delays in launches and doubling down on regional market leadership (making them stronger) may give some relief to price declines, but the overall reduction looks inevitable and irreversible. Capacity price reductions are approaching supersonic speeds, with the Broadband vertical the first looking to register a below $100/Mbps/month price in 2021, soon followed by Backhaul and Maritime cruise segments. With newer modem and antenna technologies employed on aircraft, ships and trunking sites to increase the MHz to Mbps conversion rate, and a higher overall integration of the ecosystem to enable economies of scale, the decades-old lease model is out of sync with the fast-changing requirements of customers today. Duration of contracts are getting shorter, and customers are willing to change operators/service providers if the next gen price point is available, with negotiations sometimes every 6 months. The range/spread of pricing over the mean index price as well is getting squeezed as compared to previous years – hinting at a higher commoditization rate. Slow pivot to a managed services adoption model by the operators also hasn’t helped. The rate of the range decline is also seen as increasing over the past year and is expected to clock 12% per annum in the next two years. In this scenario, every player in the market must bet on retail models, moving downstream from not only wholesale but also managed services towards a subscription-based, recurring model, with high independence from duration of contracts, and plans to adjust for volume vs. price negotiation. Though, not all players can absorb this telco like pivot, especially operators that seem restricted with managed services catered towards only large capacity clients. Managing networks for small customers and servicing them necessitates specialization that service providers are best suited to. With LEOs wanting to go after landing rights in each country and with operators seeking market entry in non-native markets, the role of country specific service providers is set to become ever more important. The race to build exclusive partnerships in a country or acquire such companies will decide the near-term fate of pricing equilibrium. There is significant evidence that satellite market dynamics are shifting from regional to country specific, 5 years after the first large HTS payload in ViaSat-1 was launched. Moving forward, averages should matter less, and subscription models tailored towards each country matter more, with certain exceptions in the mobility sector. Players registering lowest CAPEX per Mbps per vertical consistently or servicing at lowest ARPU per GB will nose ahead and win in the long term. NSR predicts capacity pricing will further decline 10-18% in the next two years due to both competition and anticipation of large HTS payloads due to launch by 2021. The only truly future proof strategy left may be to go down the value chain and create dominant positions in country specific markets, either by market entry partnership or large-scale acquisitions.